Coffee consumption in India has recently grown and it is not a bad idea to start a coffee shop. So, there is a market for coffee and there is a constant need for a coffee shop. Finding a good and local roaster (a company or person that processes coffee beans) who offers high-quality products at low cost is important to keep the cost of production low. The most expensive investment in a coffee shop is the coffee shop equipment. And for this, we’ve got you covered. 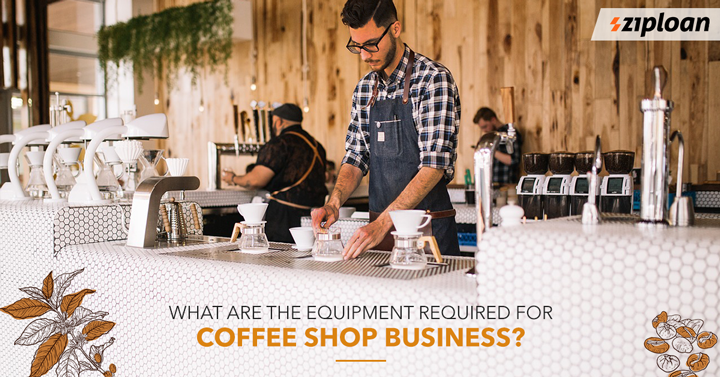 Read on to know the equipment required for a coffee shop. A drip coffee maker is used to brew coffee. The machine should be durable to produce high quality and quantity of coffee and meet the demands of even busiest days. Most coffee shop owners have multiple coffee makers to blend high quantity at once. However, you are suggested not to keep more than 3-4 blenders. An excellent espresso machine is required as many customers these days like to order an element of espresso with steamed milk. However, the espresso machine can skyrocket the capital budget. So, it is important to ensure that you shop intelligently after considering all factors and choose the right machine at the best value. Many shop owners like to grind the coffee beans immediately for the freshness of the coffee. This means there is a requirement for a coffee grinder. Again, it is important to invest in the right grinder that can make all the difference in the flavor and aroma. Milk and water ain’t equipment but they plan a very important role in making coffee. The right liquid in terms of milk is important as it can make a huge difference in the quality of the products. And if you think that milk doesn’t vary much, then you are wrong. It varies in terms of whole milk, reduced-fat milk, low-fat milk, and fat-free milk. And these types of milk vary in taste. And when we talk about water, it has ties with the filtration system of the espresso machine. If the water mineral content is high, it can damage the equipment. also read: how digital marketing can be beneficial for an sme in INdia? A refrigerator is certainly required to keep the dairy and other products fresh. And you may require both- a refrigerator display case and counter fridge units. The coffee shop design must be taken into consideration when buying the refrigerator. Both must go well with each other and be aesthetically pleasing. Once you finalize the coffee equipment list, you can focus on other things. Having said that, a coffee shop business plan is very important before starting the business. And once you’ve got the plan, you start a thriving business. If you already run a coffee shop and want to upgrade or buy new equipment, you avail a business loan for a coffee shop. You can also avail the loan to expand your shop or to add other food and beverage items. Additionally, you can also register your business on the Connect App by ZipLoan to connect with other entrepreneurs and expand your business network. You can also list your product and connect with traders, manufacturers, and wholesalers. Previous article Bakery Business: How To Write A Bakery Business Plan? What Is TAN Number & How A Businessman Can Register For It?